There’s an interesting history with the blue car. The previous owner summarized it well in this email he sent me before Tim & I went to pick it up in Lancaster, SC. Sometimes the right tool for the job is the largest hammer you have available. For the most part, I try not to force it when working on a problem. 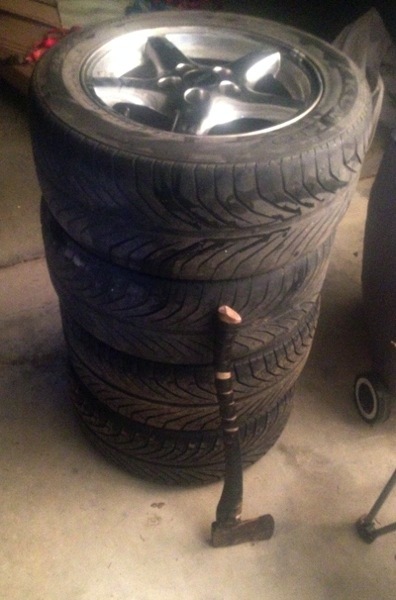 However, after trying everything I could think of, including kicking it the tire as hard a possible and subsequently a hammer and pry bar, I was making no headway on getting the rear tires removed from my car. I had been using a sledgehammer against the tire to no avail, but the leverage and weight of the blunt end of my fiancée’s axe seemed capable of providing the necessary force. After an unfortunate mishap in which I fell backwards into a halfway-full oil pan and made a gigantic mess, the wheels finally came off with relative ease. It is important to not use the biggest, heaviest, bluntest tool in the tool box as a first resort, but sometimes it is the only way to accomplish the task. After all, there is a minimum force necessary to break a connection that has fused in some way and the equation F = M * A is always true. Removing the tires on my green car was a preliminary step taken before picking up an almost identical blue version of the same car for my Z28 conversion project. Stay tuned as I do a heart transplant on my 1994 Camaro. Posted on 2014-03-23 Categories Camaro, car, stories, Z28 ProjectLeave a comment on Sometimes the right tool for the job is the largest hammer you have available.